Eyeglasses websites may claim that they offer “not-to-be-beat” prices and convenient to-your-door delivery, but the disadvantages of ordering online are much more significant than any apparent advantage they claim to provide. The truth is that there are many aspects of customer service and accurate filling of prescriptions in which our trusted family optometrists and opticians at Flagstaff Vision are far superior to any online service. Below are outlined some of the major advantages of purchasing from our trusted Flagstaff eye care professionals. Our Flagstaff Eye Care Clinic Saves You More Money Every Time! Many online retailers boast of low prices and great deals that you are supposedly unable to get when ordering directly from your local Flagstaff eye care clinic. The truth is that, most of the time while the price on some online sites initially appear to save you money, they often will cost you more money than if you order from your eye doctor’s office. 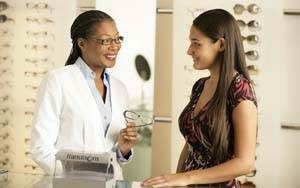 Our eye doctors and opticians maintain special relationships with eyeglasses manufacturers that allow them special deals and savings which they are then able to pass on to you, their patients. These often take the form of special rebates for patients, which our eye doctors are happy to send in on your behalf, allowing us to cut costs for our eye care patients at the bottom-line. Online services are often unaware of these rebates or require you to redeem them on your own in order to save money on your eyeglasses. We Take A Personal Interest In Our Eye Care Patients! To an online store, you are a faceless consumer. To your trusted eye care professional, you are a patient in their care. The aim of the online store is to sell you a product. The aim of your eye doctor is to help you look and see your best, and safeguard your long term eye health and visual comfort. Part of fulfilling this role is maintaining a personal relationship with each and every eye care patient. The same cannot be said about online retailers. Need Eyeglasses? Pay Us A Visit at Flagstaff Vision, Today!